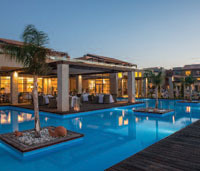 Astir Odysseus Kos Resort & Spa, constructed in 2009, is a 5-star resort that offers unlimited hospitality combined with discreet luxury and high elegance. It is located in Tingaki just 5 km from the historical Town of Kos and the port of the island and 22km from the international airport of Kos "Hippocrates". Its location is ideal for both relaxation and exploration of the island and there is a bus stop at the hotel’s entrance. Kos island combines history with the contemporary era, with many archaeological monuments and cultural highlights but at the same time with modern entertainment alternatives. 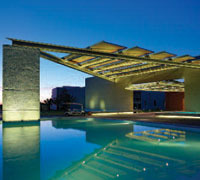 The resort consists of 267 rooms and suites all with modern design and functional layout. Specifically, there are 194 Double Rooms, 10 with facilities for disabled people, 61 Junior Suites, 8 Executive Suites and 4 Maisonettes with sharing pool. 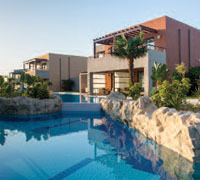 The accommodations have garden, pool, sea or sea front view. In the "Venice" complex, guests in the sharing pool rooms and suites benefit from the direct access to the pool from their terrace. All the rooms and suites are appointed with: twin beds (king size bed on request), flat screen Sat TV 24", direct telephone, Wi-Fi internet access, mini bar, individual A/C, mini safe, coffee & tea facilities, bathroom with bathtub or shower, hairdryer, bathroom amenities, furnished balcony or terrace. In the restaurants of Astir Odysseus Kos guests can taste Greek and international specialties. Refreshing cocktails and drinks are served at the resort’s bars overlooking the pool or the Aegean Sea. Enjoy the relaxed atmosphere of the Spa center with indoor pool and try out the facial and body treatments. Other facilities include mini-club, gym, table tennis, mini-market, jewellery shop, 2 tennis courts, billiards, 3 outdoor pools with 2 open air Jacuzzi in the main pool, 2 children’s pool, free sunbeds and umbrellas by the pool and by the beach, doctor on call, laundry and dry cleaning service, car and bike rental desk, parking area. Rest assured in the expert hands of the professional and experienced staff of Astir Odysseus Kos for successful meetings and events, from 20 to 350 guests. The three conference rooms of Astir Odysseus Kos are equipped with microphones, loudspeakers, podium, Wi Fi and flip chart. Overhead projector, slide projector, CD player, interactive camera, LCD TV, PC, phone and fax service, secretarial assistance and photographer are on request available. 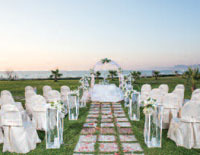 Coffee breaks and banqueting services can be organised based on specific desires and needs.